Some of you would remember I wrote a similar article few months back. This article is in continuation of that with a bigger and updated list. Most of you are so lazy or ignorantÂ enough not to click the custom option of installation of any application on your PC.Â This small laziness results in installation of toolbars, applications you never wanted. Most of the good applications give you option to deselect any apps included in that particular bundle. But many of the apps dont even give you that option. Some of the installers install toolbar apps by default untill you untick them. See some screens below and you will know what i am talking about. Here’s a compiled list of almost all the Apps / tools that bundle something or the other stuff like toolbars and badware with their installs. The list is reproduced here with help from Calenderof updates forum and some other additions from my side. BitDefender Anti-Phishing Free Edition – Ask.com search engine. No opt-in. No opt-out. 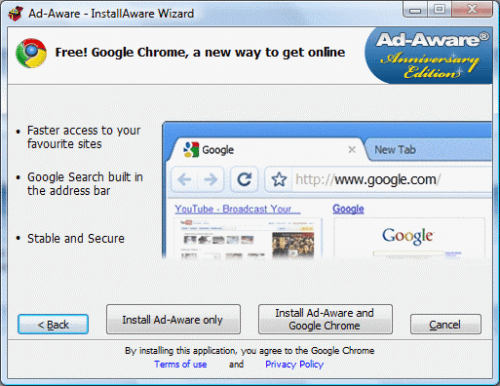 BurnAware Free – Ask Toolbar. 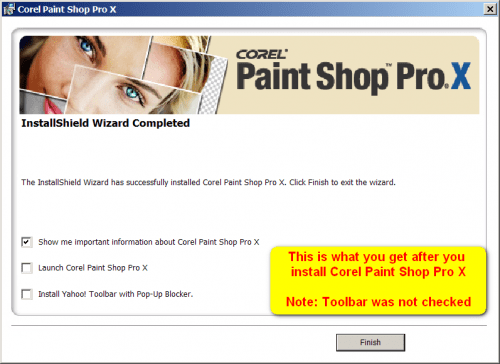 Corel Paint Shop Pro X – Yahoo! Toolbar but not pre-checked. Norton products – Ask Search in Norton toolbar. No option to remove and it was pushed by including in a Norton patch. OpenCandy – offering third party software. Report says that even if you do not install the 3rd party software, there is modification in the registry, files and will add tracking cookies. There’s also Conduit Toolbar in the page. PalTalk – Ask Toolbar. There’s a nag screen prompting to upgrade from free to paid edition. No way to turn off the nag. RealPlayer – Google Toolbar ,RealPlayer installer have Google Chrome as pre-checked. Sun Java RE (online installer) – Google Toolbar / Live Search for Windows Toolbar. YaHoo! Instant Messenger – YaHoo! toolbar, with â€˜YaHoo! Search Protectionâ€™ and homepage change to YaHoo! You can place your comments below if i missed something or if any of the above apps have changed some toolbars, or the stuff associated with their installer. I would love to update the above list based on your comments. Great list and more to add. A few installs without our permission. Any way I hate such programs. Thanks for your effort. Eu notei que o Defraggler 2.01 nÃ£o tem uma caixa para aceitaÃ§Ã£o ou nÃ£o da barra de ferramentas do Google, e o usuÃ¡rio meio que necessita adivinhar que, para nÃ£o ter a Google Tool Bar instalada, tem que desmarcar a opÃ§Ã£o de aviso automÃ¡tico de atualizaÃ§Ãµes do Defraggler. Creio que, relativo ao Google, foi a situaÃ§Ã£o mais grave que encontrei atÃ© agora, visto que, em programas como Skype, mesmo a opÃ§Ã£o vindo verificada por padrÃ£o, o usuÃ¡rio encontra facilmente o meio de impedir a instalaÃ§Ã£o.